Chances are that if you're reading this article, you already know how awesome the Mill City Farmers Market is. If you happen not to, I have three words for you: Go! It's AWESOME. Whenever we have out-of-town visitors we take them to the Mill City Farmers Market on Saturday morning because, frankly, we are huge show-offs and this market highlights all that we love about our fair city. Overlooking the mighty Mississippi and nestled between the august and dramatic Guthrie Theater and the cool and historic Mill City Museum, the market's setting is spectacular. But it's the people at the market, whether they be the founder (I'm looking at you, Brenda! ), the vendors, the managers, the chefs, the volunteers, or the foodies who are there to graze, shop and chat, that make it truly special. The mission statement for the Mill City Farmers Market (MCFM) is as follows: Our mission is to promote local, sustainable and organic agriculture, increasing economic opportunities for farmers, urban youth, small businesses and food artisans, to offer experiential learning about and access to healthy local foods, and build a vibrant gathering place for Minneapolis residents and visitors. This will be the sixth summer for the Mill City Farmers Market, and I would say mission accomplished. The beauty of it is that it just keeps growing and changing -- organically, as it should. 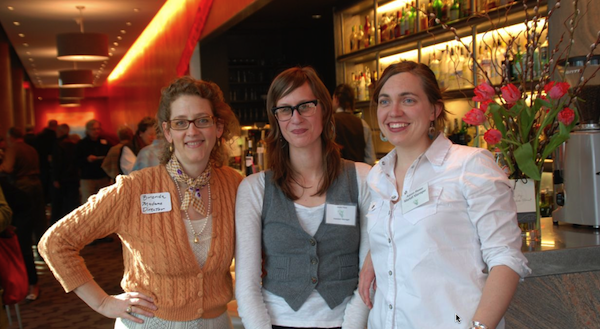 Earlier this week, I had the privilege of attending the MCFM Spring Preview Party at Spoonriver with my friend, Amanda, and we got to meet the lovely Brenda Langton, who owns Spoonriver, founded the market and has tirelessly worked to promote healthy foods and local farmers in our community for a very long time. Of course, I played it cool and didn't let on to the fact that I've been secretly spying on her for years, since her Cafe Brenda days in the early nineties when I was a young lawyer working a block away and completely intrigued by her sparkly green gem of a restaurant nestled in a land of bar and grills. Being the consummate hostess, Brenda made sure we had drinks, introduced us to her market managers, Jesse Haas and Aaron Reser, and shooed us in the direction of the vendors who were standing by with smiles and samples. I love samples. And smiles. But really, samples. We dove right in and started eating and asking questions. We tried a delicate savory crepe made by Jennifer Wourms of Crepes by Spoonriver that had goat cheese, herbs and Chiogga beets in it. 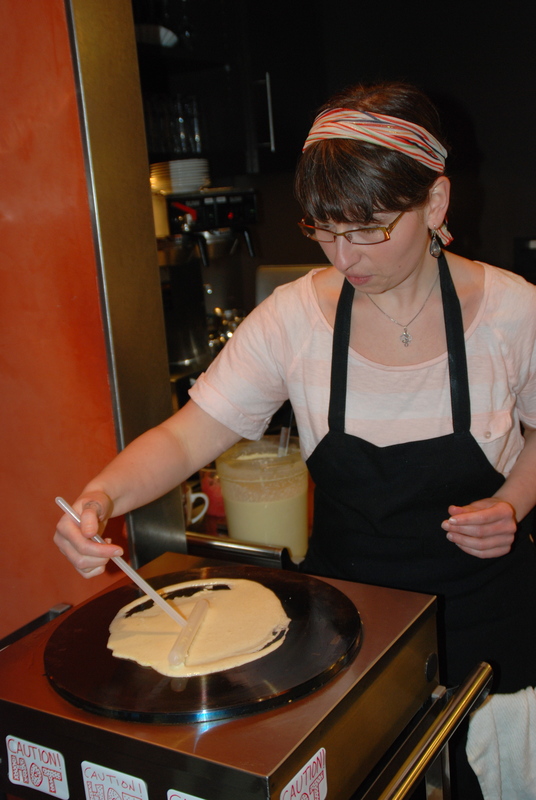 I could have watched her ladling and smoothing out those paper thin crepes all night, but we had more samples to sample. Next we chatted with Steven Read and tried his glorious award winning sheep's milk cheeses from Shepherd's Way Farms near Northfield, MN. I especially loved the mild funkiness of a cheese they call Shepherd's Hope, but also had to restrain myself from emptying his plate of blue cheese into my camera bag and scurrying off to a corner to gobble it up. Next to Steven was Heather Hartman, who is one of the chefs who puts on cooking demonstrations at the market at 10:00. She had made a wonderful wheat berry salad and another salad of various sprouts, whose grower they hope to get into the market next year. Heather told us she features recipes that show people how to prepare the things currently available at the market. If the farmers let her know that they are having a bit of trouble selling a certain vegetable, she’ll come up with a recipe to highlight that vegetable. By educating people and expanding their palates and cooking repertoires, she is helping out the farmers. As consumers and foodies, what can be better than having more and more delicious ingredients demystified and added to our arsenals? It's a win-win and exactly what the Mill City Farmers Market does so well. Then we met Zoie Glass of the charming Lucille's Kitchen Garden. 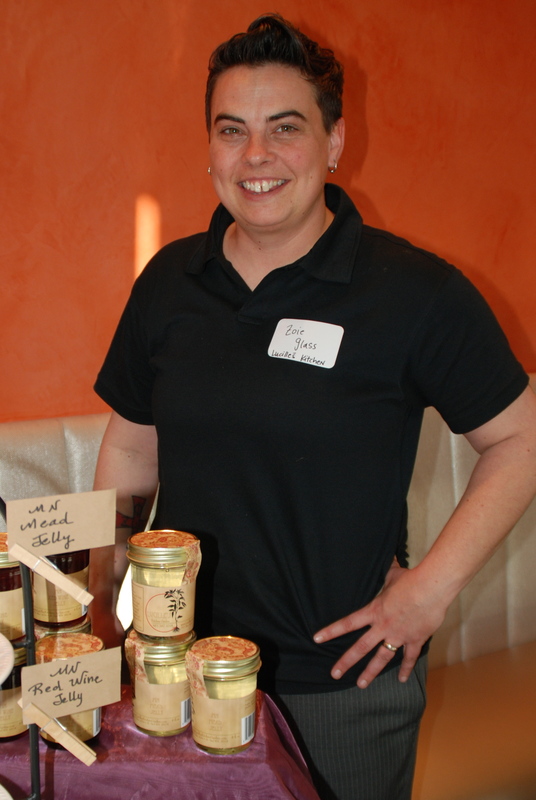 Lucille's Kitchen specializes in artisan preserves and is located in Northeast Minneapolis. In past summers, they have sold their various pepper jellies at the market, which they will continue to do, but we were able to try their new speciality jellies that contain mead, red wine, and white wine. I had a vague notion that mead is something drunk out of chalices by knights in Monty Python movies, but it turns out this is only partially correct. Mead is actually honey wine, and Zoie plans to slather a salmon with her mead jelly and roast it for Easter, which sounds amazing. The jellies are complex and interesting and practically beg for cheese. 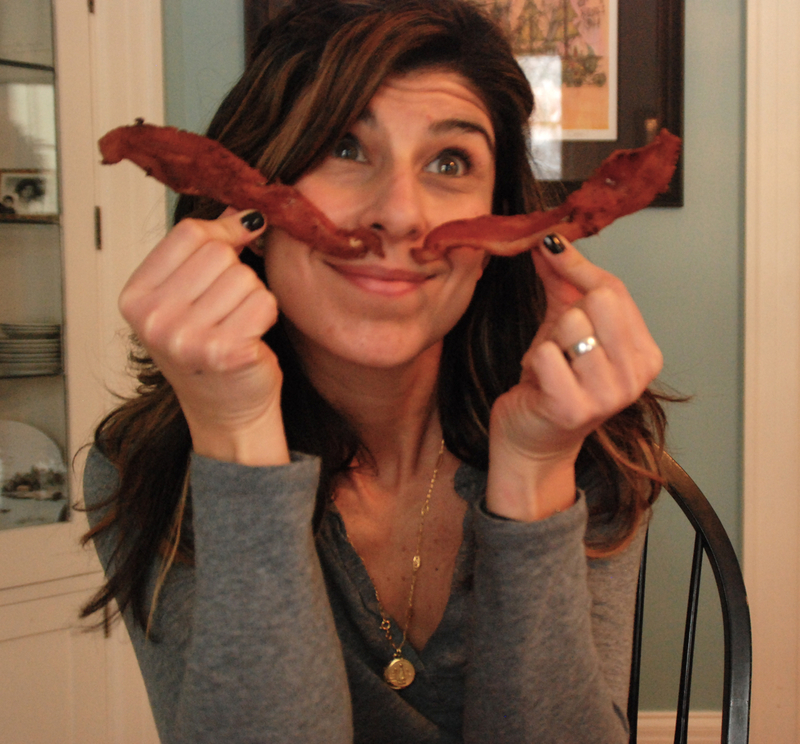 We moved on to meet Leslie Powers of Bliss Gourmet Foods out of St. Paul and sampled her granola. Amanda and I both opted for the butterscotch, which Leslie served with a dollop of Greek yogurt and berries. It was absolutely heavenly and apparently comes in gluten-free varieties, as she sources her oats from a place that certifies that they have not come in contact with wheat. Zoie Glass from Lucille's Kitchen GardenAt the end of the line was Fereidoon (Fred) Golchin, the owner of French Nugget which is a beautiful, mysterious product that contains dark chocolate, almonds, honey and raisins. It can be eaten alone or with cheese. As we savored our fabulous slivers, Fred told us about his kitchen in Burnsville. He also makes a version of the nugget with lavender and sea salt, which I will be hunting down this summer! Finally, we ended up at the table I had been eyeing all night - Wild Idea Buffalo Company. Josh Resnik is the CEO and as he ladled out the delicious buffalo brisket over mashed potatoes he had prepared, he told us about the company’s mission to preserve native prairie lands by grazing buffalo on them, which they then harvest humanely in the field. The meat is 100% grass fed, free roaming, antibiotic and hormone free, and I can tell you it’s delicious. This is meat you can feel good about eating. Not only is it healthy and loaded with Omega-3’s, but the more the business grows, the more prairie they will be able to preserve. Dan O’Brien, the founder of Wild Idea, has taken a very deliberate approach to doing something simple -- putting ruminants back on grass where they belong. As I looked around the room, I was struck by the notion that this is exactly what all these people, including Brenda, are doing. In mindful and deliberate ways, they are all trying to make food simpler, fresher, healthier, closer to home, and ultimately, more delicious. The best way to do that is to remind people how good it tastes and how good it feels. When you can talk to your farmer, cheesemonger, or baker, when you can ask questions, laugh, and establish a connection, then that food is more nourishing in every aspect. Once you start, you want to buy as much of your food as possible this way, which allows these passionate farmers, artisans, and small business people to succeed in doing something they love. Again, a win-win situation. The Mill City Farmers Market is located at 704 2nd Street S., Minneapolis, MN 55401. It opens on May 7 and in addition to the gorgeous local, organic and sustainable foods, fresh flowers, pasture-raised meat and eggs and artisanal products, it will feature healthy cooking demos, live music and entertainment, local beer and wine tastings, the ever-popular mini-farm, family activities, visiting artists and craftsmen and a sound commitment to Zero Waste initiatives. The hours are from 8:00 a.m. to 1:00 p.m. every Saturday through October 15.